I have just returned from a brilliant weekend in Westport, on the Atlantic Coast of Ireland. 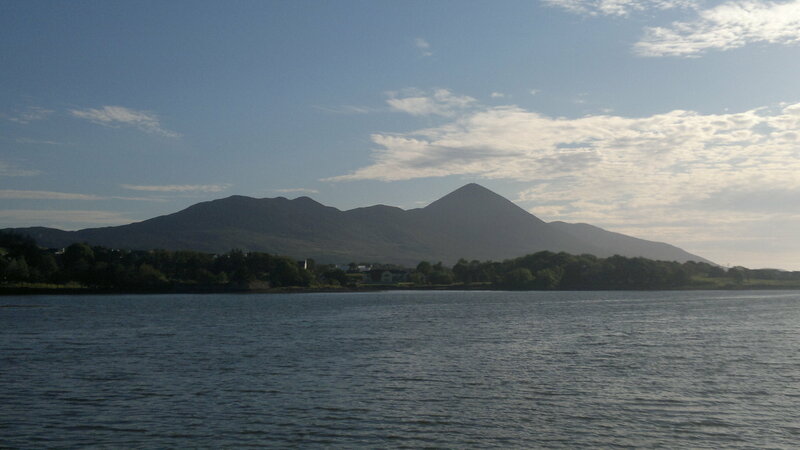 A beautiful small town nestled under the stunning Croagh Patrick mountain, with the glorious Clew Bay full of amazing islands right in front of the town. 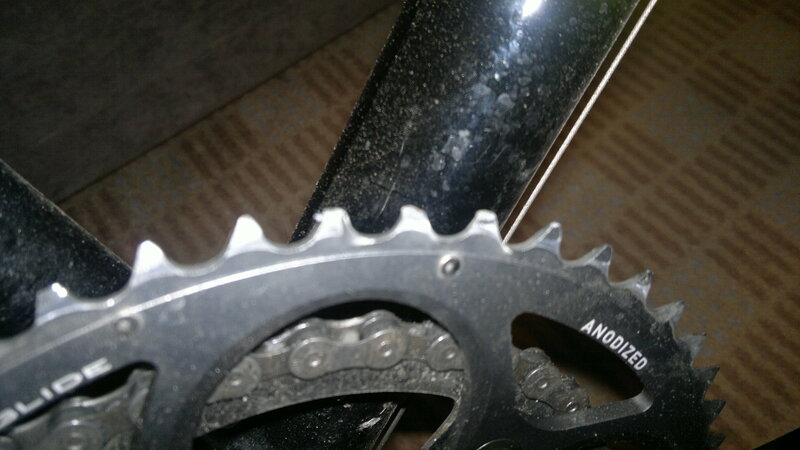 and despite good padding, had managed to bend a few teeth! Not a good start, so with a wee spanner I bent them back, and took the bike out for a test ride, just a short one to Westport Quay to recce the finish of the race. It had been an amazing day, and the sunset was fantastic over the bay. Friday morning I set off with Brian Keogh to register and then recce the course. Brian had very kindly offered to show me the route, and to point out all the tricky and interesting parts of the course. With such a short fast race it was crucial to me to know all the ins and outs of the route, where to go hard on the bike, and where to take it very easy. The weather was atrocious, driving horizontal rain, cold and windy, perfect for me to be out racing, but the forecast for Saturday was to improve. At the base of a very cloudy Croagh Patrick Brian pointed out the route, and then very kindly, the cloud lifted to show the full peak, a striking cone of loose rock at the top that I would have to race up and down. After checking out the final short off-road section, which I’d be riding on a road bike, I thought I’d probably run it, depending on the situation, as it was slightly daunting and it would reduce the chance of a puncture, but also because with a very sore thumb sustained from a fall a few weeks ago, the task of holding the bars would be very painful. After a pasta feed, getting my kit sorted and setting my alarm for 4a.m. (!! ), I went to sleep. The alarm call was not overly pleasant. But I jumped up, got dressed and joined with some other racers in the breakfast room, all bleary eyed, but excited about the race. Jumping on the bus with about 100 other people we drove to the start at Glassilaun Beach. It was a lovely morning, and the views along the road were great. Finally standing on the beach, eyeing up all the opposition, was nerve wracking. I knew the race was going to be fast, especially after being introduced to some of the whippet looking triathletes, and I said quick hello to last years winner Padraig Marrey (who I’d met at the Ballyhoora Beast). As the gun went, people took off at a heck of a pace, I knew this would happen, and I sat in at as comfortable a pace as I could and hung on for the first road section. We soon hit the rough off road section. It was here that I started to pass a lot of people, lapping up the rough boggy section. However as soon as we hit the tarmac again people began to catch up and pass me again. After a tough hour of running we arrived at the kayaks, I was slightly confused by the instructions due to my fatigue from the run, and put on a buoyancy aid before I got to the kayak, only to find one there for me, oh well. I jumped into the boat and instantly overtook a bunch of people, and paddled as fast as you can in a sit on top. I began to pull back the leading pack, and after the very short paddle I had pulled up to 5th after entering the water in about 20th place. The run to the road was perfect for me, baby heads and boggy ground, I again pulled ahead of other people, only for them to come back to me on the tarmac, but I stayed with Niall this time, and entered the bike transition in 5th place. A superfast transition enabled me to get out with Tom O’Dowd in first place. I stuck to his wheel, as I knew I’d be a bit slower on the bike, I just don’t have the speed in my legs for the short distances at the moment. The cycle started well, Niall caught up and then we worked together till the first hill. I was dropped straight away, and couldn’t get back to either of them after the tight tricky descent. I rode on my own for a good section, and then Padraig and Peter came past at pace, I gave it everything and got onto their wheel, and again worked with them to catch the 2 leaders. I was dropped again on the fire road climb, but kept in touch as best I could before we hit the mountain. I was a minute down getting off the bike, but struggled to catch up on the hill side. 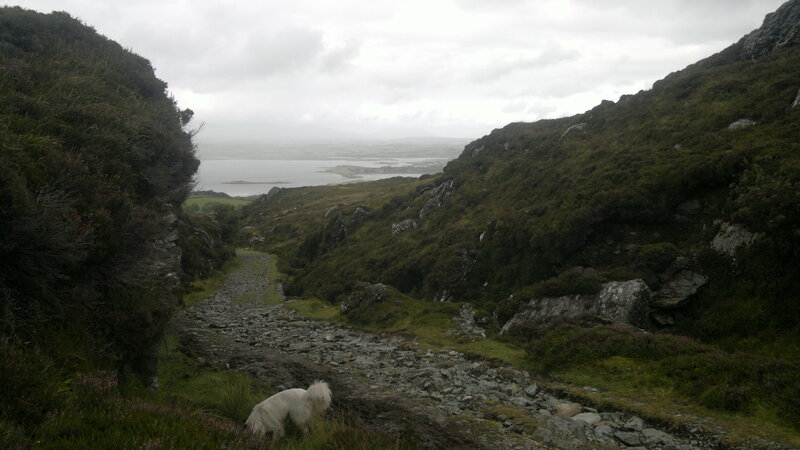 The top section of Croagh Patrick is really steep and loose, and I didn’t enjoy it much. Pushing on as fast as I could, knowing that there was still a chance to get into the top 3. The top was almost in sight when Peter came running towards me followed by Tom then Padraig, I would have to give it everything on the decent. Taking in the stunning view from the chapel for a split second I turned and ran as fast and in as much control as I could on a technical loose descent. I overtook Niall quickly, but lost sight of the others. Not knowing the hill I had no idea of the best line down, so I just ran back the way I came up, following the line of folks coming up the hill. I couldn’t see the others at all on the way down, concentrating on my line and staying on my feet, but kept going as fast as possible. I knew I had to get to the bottom very close to them to have any chance of making the top 3. Sadly I couldn’t take enough time off them on the way down, but knew I was well clear of Niall now in 5thplace, so I took the last cycle a bit more cautiously than I might have done. I ran the really rough section, mainly to not puncture, but also as my thumb was very sore when holding tightly on the bumpy ground. The tarmac road was pretty rough too, with tight corners and gravel to keep you focused at the end of a very tough race. The rough off road section on the final bike - fun on a road bike! The last section was lovely, passing by the clear sea water, and finally seeing the finish line. It was tough passing right by the line, especially as Peter was just coming in to cross it as I went past! The last run was tough, tired legs on rocky ground is always fun, but I took it easy and was very happy to cross the line in 4th place, only 5 minutes behind the winner. It had been a fantastic race. Very fast and full on, but great to be so close, and the lead chopping and changing all the way to the finish. I was incredibly happy with how I had got on, if someone had offered me 4th place on the start line I’d have more than happily taken it. It was nice to see that I could battle right up at the front, but not surprising that I couldn’t quite topple the top 3, all very experienced in this race, and the shorter distance. For me, it really was a bit of a sprint race, I’d have liked it to be 4 days longer!! I have had a brilliant weekend over in Westport with Gaelforce West as my hosts. It is a stunning location for a multisport race, very dramatic and rugged. The town really does embrace the sport which is so great to see. The event was brilliantly run, all the transitions were really smooth and slick, and the course was signed very clearly. A fantastic effort from the team to put on a race that not only really tests the elite, but is achievable by all the competitors. A huge thank you to Ciara and all the team at Gaelforce Events for inviting me over for the weekend. I loved the race and the fantastic hospitality, it was great to meet a bunch of new people, and hopefully I’ll be back over to Ireland soon to enjoy some more of the fantastic events on offer. A big thank you to all my sponsors for my top class kit too, my adidas bike shorts, arm warmers and gillet were spot on for a chilly start, and my adidasTERREX trainers for being the perfect combination of grip and comfort for the mixture of road and muddy off road running.